Our goal at Top Marketing Agency is to provide comprehensive Internet Marketing Services specifically geared to grow your presence on the Internet and provide the best Return on Investment (ROI) for your business. Leverage the most advanced social marketing techniques to bring your business into the forefront and generate more qualified leads. Our team of experts understands the ins and outs of marketing on Facebook and Instagram and can provide tailored solutions that meet the unique needs of your business. Activate advanced targeting capabilities and compelling creative across social channels to reach and convert target customers. Drive engagement and generate leads through consistent optimization of ads and measurement of important ad metrics like clicks and views. Complement your existing search advertising and SEO marketing efforts and reach untapped audiences. 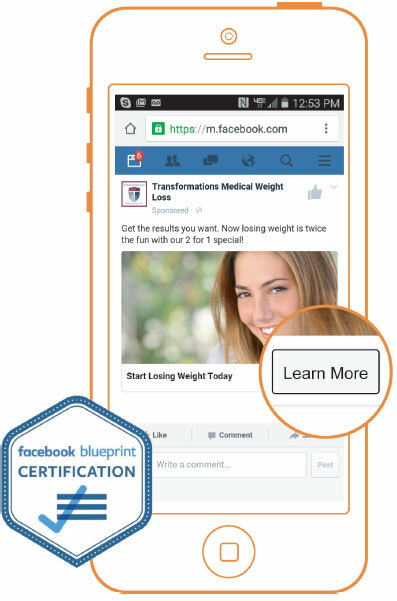 Facebook’s Blueprint program. Your ads will be reviewed daily and optimized to accelerate performance. Reach the optimal Facebook users for your business based on location, demographics, interests, online behavior and more. Employ unique programs that increase the quality and quantity of visits to your website andleads in your inbox. Implement a unique Facebook advertising strategy that meets your business objectives and complements your other marketing efforts already underway. Maximize the way you engage your target audiences with Facebook Ads across desktop and mobile mediums with expansion to Instagram and the Facebook Audience Network. Website ClicksIncrease your website conversions with custom ad CTAs that speak to your target audience(s). Drive qualified traffic to your site with the goal of generating newsletter signups, requesting trials or quotes, and more. Lead AdsConvert prospects faster with short forms directly inside your ads. These in-ad forms capture prospect email addresses and other relevant information and are delivered directly to your TopMarketingAgency software inbox*. Lead Ads with TopEdge*Manage your new leads in the most secure way possible. With Lead Ads with TopEdge, you can ensure that the sensitive data your prospects share with you will be protected. Retargeting & Custom AudiencesGrow your business by finding prospects who are similar to your top clients by targeting previous site visitors and “lookalike” audiences with strong ads that resonate. Instagram AdsExpand the reach of your ads to Instagram and generate even more traffic and leads from your social marketing. With more than 1 billion monthly active users, incorporating Instagram into your marketing efforts can provide you with an added boost to your marketing efforts. Facebook Audience NetworkBroadcast your message through the Facebook Audience Network and expand the reach of your existing advertising efforts on hundreds of apps without making any changes to your creative. Need More?We understand that every business is unique. Get in touch with us to create a custom social advertising plan that leverages audience targeting, emerging ad platforms and distribution strategies that help you reach your goals.